Balloons was the first patterned promotional item that came as a Chip and Dip set. The Balloons set retailed for $3.95 when it was released in 1958. Unofficially known as “Balloons,” this design was the first patterned promotional item that came as a Chip and Dip set. The set comes with both the 441 and 444 Cinderella Bowl and a metal bracket that attaches to the large bowl for the purpose of holding the smaller bowl. 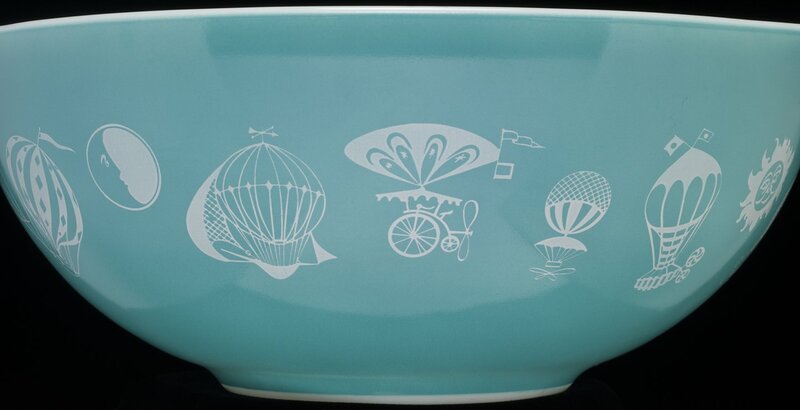 Balloons is turquoise with patterns of white hot air balloons, a flying bicycle contraption and a crescent moon. The set came with a suggestion card on how the new Chip and Dip set might be used. Along with using the set for chips and dips, the bowls could also be used for salad and dressing, as a punch bowl and used separately for “mixing, serving, and baking.” Balloons retailed for $3.95 in 1958.